Joseph Csaky was born on March 18, 1888 in Szeged, Hungry. Csaky only studied for a short time at the École des Arts Decoratifs in Budapest. In 1908 he went to Paris where his artistic style underwent some change. Influenced once by Rodin’s post romantic lyric style, this was replaced by the influence of Maillol’s more rigorous and sensual style and then eventually by the Cubists. In 1911 Picasso produced his first cubist sculpture, and it was in this same year that Csaky created la Tete Cubiste. After World War I, during which he fought in the French army, Csaky, still under the cubist influence, continued to examine the human form through his sculpture. From 1919 he began to explore abstraction. He sculpted into stone tangles of spheres, cones, and cylinders. After 1928 he returned to a more realistic style of sculpture. Csaky sculpted in a variety of materials including above all the hard stones such as onyx, marble, and rock crystal. 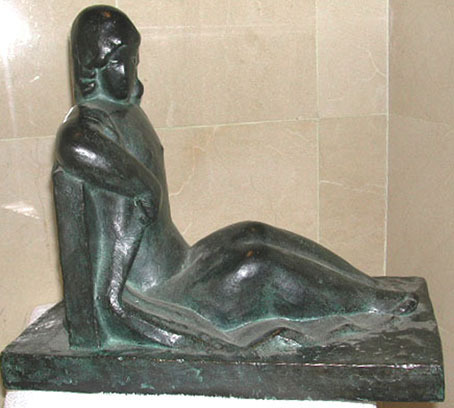 After World War II he mostly created sculptures in bronze. In 1911 he exhibited with a group in the Salon d’Automne and the Salon des Indépendants. He also exhibited in the Salon de la Société Nationale des Beaux Arts and the Salon des Tuileries. He participated, as well, in the collective international exhibitions in Germany in 1932, Holland in 1933, etc…In 1956 he also had the opportunity to create to bas-reliefs for a scholarly group in Amiens.